Donald Tusk has courted controversy by saying there is a "special place in hell for those who promoted Brexit without a plan". He was speaking at a news conference in Brussels following a meeting with Irish Prime Minister Leo Varadkar. Tusk, president of the European Council, made the comment as British Prime Minister Theresa May struggles to get her Brexit deal through parliament. The comments point to a breakdown in relations between London and Brussels with just weeks together before the UK is set to leave the EU. After the end of the news conference, the Irish PM was overheard on a live microphone telling Tusk: "They'll give you terrible trouble, the British, for this." A Downing Street spokesperson said it was a question for Tusk "whether he considers the use of that kind of language helpful". "We had a robust and lively referendum campaign in this country. In what was the largest democratic exercise in our history, people voted to leave the EU," the spokesperson said, adding the focus was now on how to leave the bloc "in an orderly manner". Tusk reiterated his remark on Twitter, instantly sparking thousands of reactions from both backers and critics. One of them came from Brexit campaigner Nigel Farage. "After Brexit, we will be free of unelected, arrogant bullies like you and run our own country. Sounds more like heaven to me." Varadkar, visiting Brussels a day before May as Ireland strives to protect its interests in the bloc, said the Brexit deal made last year was "the best deal possible". 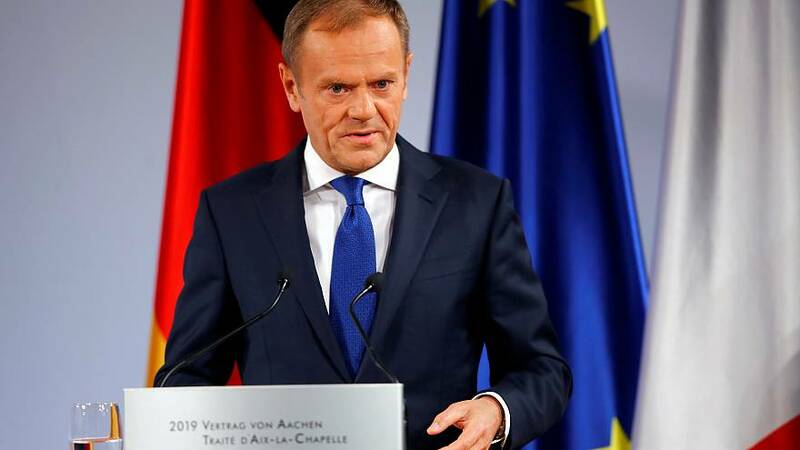 EU summit chairman Donald Tusk said he had abandoned hope that Brexit might be stopped and said on Wednesday his priority was now to avert a "fiasco" in 50 days if Britain crashes out without a deal.